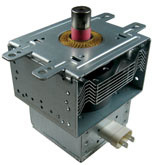 W10222507 Whirlpool Microwave Oven Magnetron. Replaces AP4366613, 8205363, 1482486, AH2345030, EA2345030, PS2345030. Click MORE DETAILS link for specific model coverage.